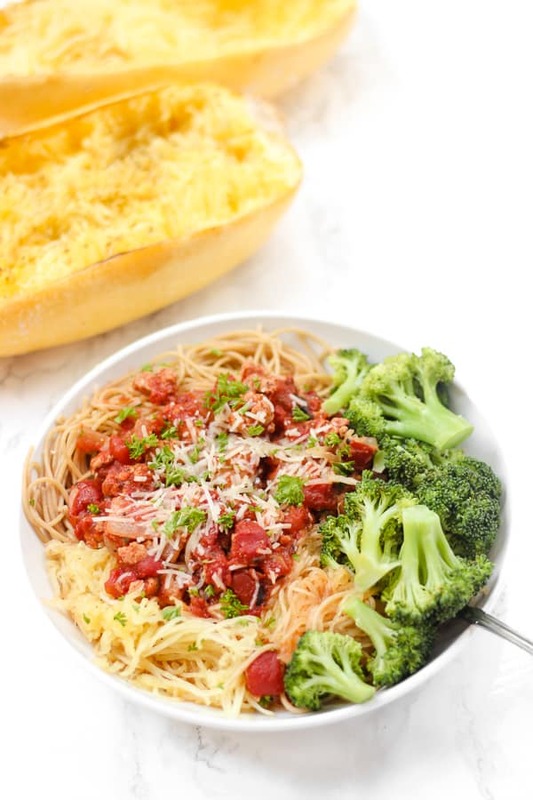 These Italian Spaghetti Squash Pasta Bowls are the perfect way to enjoy a huge bowl of pasta for dinner without feeling weighed down! New favorite dinner right here. There are few thing I love more than a bowl of pasta, and even fewer things I love more than a giant bowl of pasta. 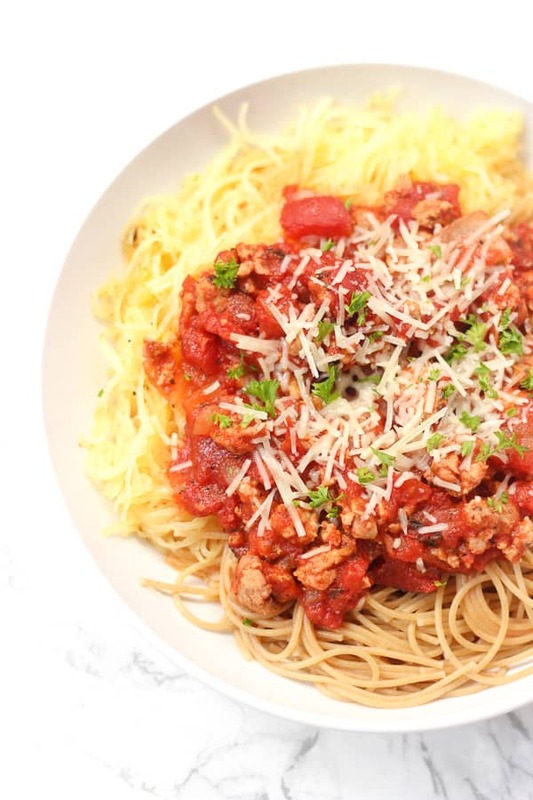 Spaghetti squash is a great way to bulk up a normal bowl of pasta and add some serious volume. And although I like spaghetti squash, when it’s mixed with the regular pasta, the taste of the spaghetti squash is almost unnoticeable. Of course, you could make the sauce and serve it with all spaghetti squash, or all regular noodles, but I loved the half and half combination of the two. 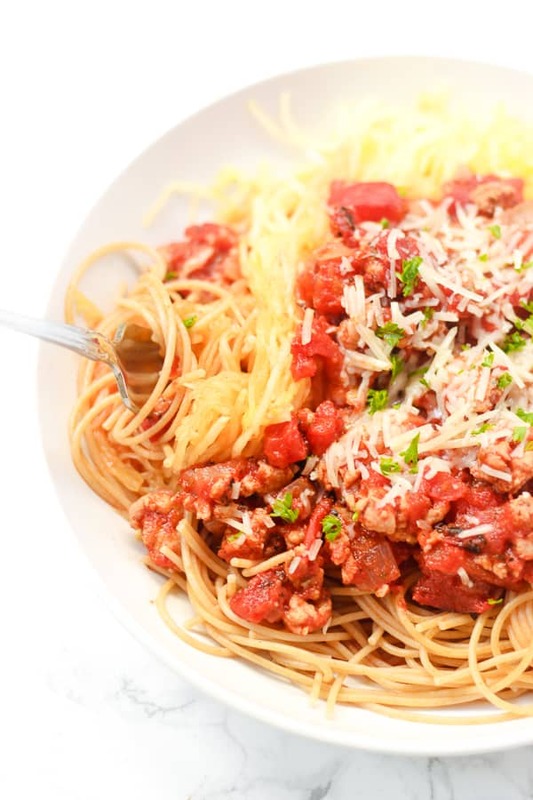 It’s a lighter way to enjoy a huge serving of pasta without feeling weighed down afterward. For each person, I used 2 ounces of whole grain pasta (thin spaghetti or angel hair works best to mimic the shape/texture of spaghetti squash), plus a generous serving of the squash. 2 ounces is a serving of pasta and it’s actually pretty small, but when mixed with the spaghetti squash, sauce, and broccoli, it was SO filling and I actually ended up saving half of my bowl for lunch the next day! 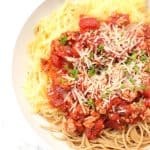 For these spaghetti squash pasta bowls, I made a batch of my favorite spicy chicken sausage tomato sauce, but you could use whatever sauce is your favorite. (I do love this sauce, though– it’s so good.) I topped my bowl with lots of parmesan cheese, but a spoonful of ricotta cheese on top would be amazing, too. To cook the spaghetti squash, there are two options. You can either roast the squash whole, which takes a bit longer but eliminates the need to cut the squash in half, or you can cut the squash in half first. 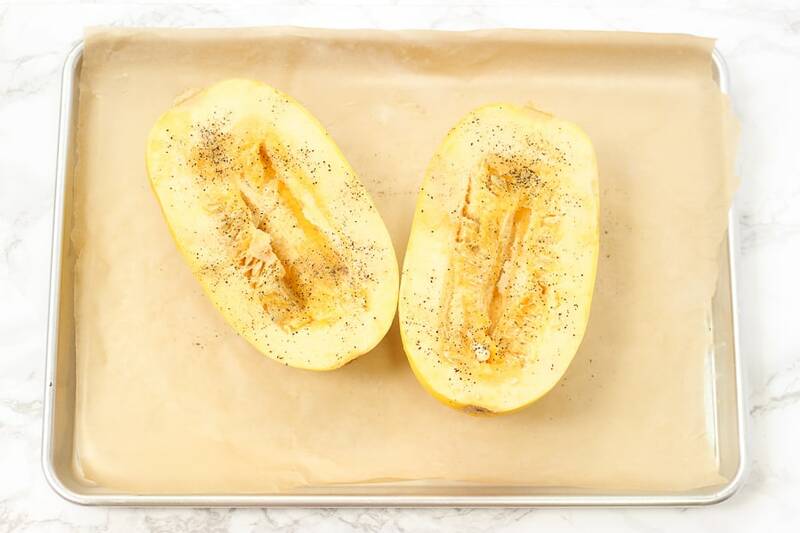 I was in a bit of a time crunch, so I carefully cut the squash in half with a sharp knife, placed the halves on a parchment-lined baking sheet, drizzled them with avocado oil, and sprinkled them with salt and pepper. I turned the two halves facedown on the baking sheet so they wouldn’t dry out. Then, I roasted the squash for an hour at 375 degrees, until I could easily discard scrape out the seeds and then scrape out the strands of squash. While the squash was in the oven, all I had to do was assemble the sauce, steam some broccoli, and cook the noodles. While the sauce simmered, I first cooked whole grain thin spaghetti noodles. While the pasta, squash, and sauce cooked, I chopped up the broccoli. Then, after draining the pasta, I quickly steamed the broccoli in the same pot (to reduce dishes!). After the broccoli was done, it was time to assemble the bowls. 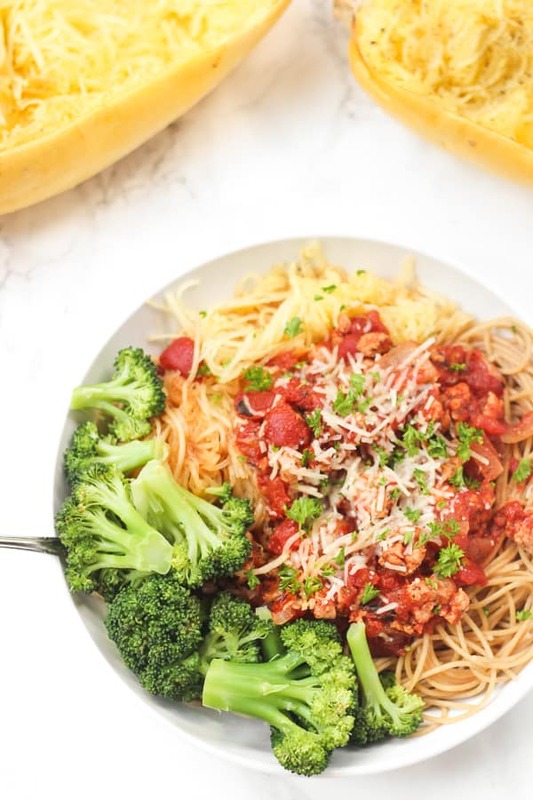 A heaping bowl of pasta/spaghetti squash, a generous serving of broccoli, a few big spoonfuls of spicy sauce and a heavy sprinkle of parmesan cheese on top…the best! If you try out these spaghetti squash pasta bowls, feel free to let me know in a comment or take a picture and tag me @livbane on Instagram. Hope you enjoy! First, cook spaghetti squash. 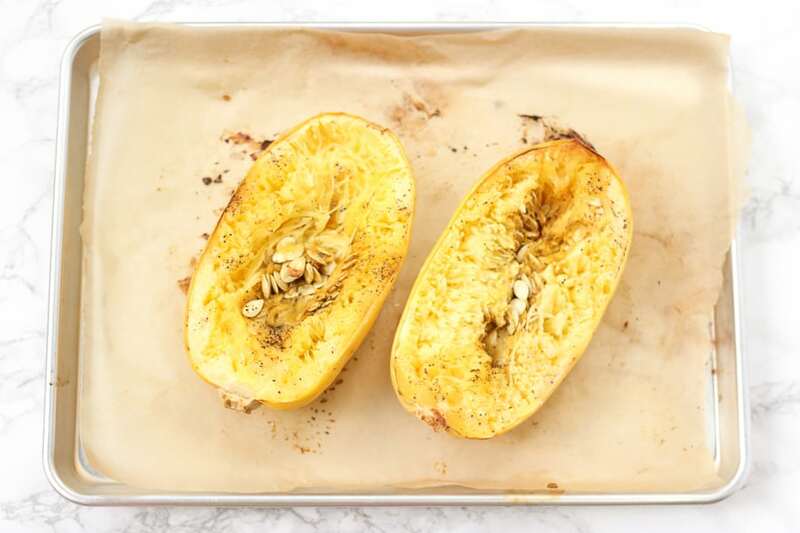 Option 1: carefully slice the squash in half lengthwise, place halves face-down on a baking sheet, drizzle with cooking oil, sprinkle with salt and pepper, and roast for 60 minutes at 375 degrees until squash strands can easily be removed with a fork. Option 2: Place whole squash directly on oven rack and bake for 75 minutes at 375 degrees. 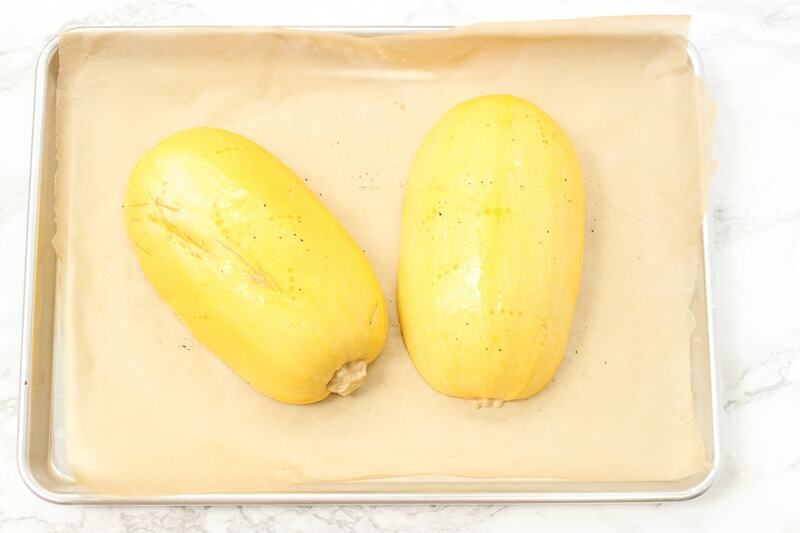 Allow squash to cool for 10 minutes, cut in half lengthwise, and then sprinkle insides with salt and pepper. While squash is cooking, cook chicken sausage, onion, and garlic in a large skillet or saucepan over medium-low heat for 7-8 minutes, along with any additional (optional) veggies if using. Once sausage is cooked, add dried Italian, crushed red pepper flakes, salt and pepper to taste, and fire-roasted crushed tomatoes. Keep on low heat until it's time to serve it. While squash is still cooking and once sauce is done, cook pasta according to package directions and drain. I added chopped broccoli florets to the pasta water for the last 3 minutes of the pasta cooking time, being careful not to overcook the pasta. Place squash and pasta in each bowl, along with any extra veggies, top with sauce and parmesan cheese, and enjoy! Store leftovers in fridge for up to 3-4 days. Feel free to substitute your favorite meat sauce. Looking for other pasta recipes? You might like my one-skillet baked ziti or slow-cooker veggie lasagna! Your dining hall has spaghetti squash?! That’s amazing!!! This is the perfect season for spaghetti squash, isn’t it? As a birthday treat for your brother, I bet he would enjoy your cooking the dish for him. You’re right, spaghetti squash is in its prime right now!! Mmm this looks yummy! I heard you can cook spaghetti squash in an insta-pot…. life changer! Oh , that’s good to know! 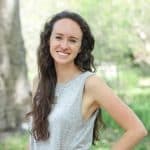 I don’t have an insta-pot but have heard such good things and would love to get one when I graduate and have my own kitchen next year! I love how you mixed spaghetti noodles and spaghetti squash. It looks like such a hearty filling meal. It was SO filling! I honestly couldn’t even finish my bowl and saved the rest for lunch the next day! Ooh, these look perfect! I wish spaghetti squash was more readily available here! Your photos are beautiful! We are on the same page again – working on a stuffed spaghetti squash recipe now. Looks delicious! Spaghetti Squash is one of my favorites. Been reading Live Longer, Live better by William Manger and he has really shown me that what I thought was good for me wasn’t totally as it seemed. Of course diet is a huge part of that. I have been studying Health Education and this was a resource I picked up to help with that, and then I took it to heart and now I am already feeling better after reading it. I didn’t like spaghetti squash at first as it was a pain in the rear to prepare, but now I find it fun to cook with and I like it too! I’m so glad you’ve grown to love spaghetti squash, too! It wasn’t my favorite at first, either, but now I really enjoy it in so many different recipes! Olivia, you may have to show some really delicious soup recipes for people to eat and warm up in this freezing weather. I have a new soup recipe coming soon! ??? ?